RMT has developed a number of benefits to save members money. This includes negotiating access to savings and special offers from our approved partners. COLLECTIVE BARGAINING The union has a dedicated team of elected officers and local reps to serve your interests negotiating with employers on issues from pay, hours of work, pensions and working conditions. They are supported by a team of researchers to formulate pay claims to obtain the best negotiated terms for you. CAMPAIGNING The union has a political fund to run campaigns and provide a political voice to benefit members’ interests in the workplace. 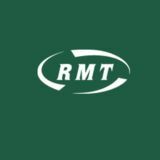 RMT has a very active parliamentary group which raises issues of concern for members at Westminster, the Scottish Parliament and Welsh Assembly. PERSONAL INJURIES Personal injury claims cover if you suffer an accident in work or outside work. RMT underwrites settlements that would not be provided by nowin, no-fee companies. Call 08457 125 495. RETIREMENT BENEFIT Payable to any member who retires over the age of 60 or aged 55 if retired through redundancy or resettlement. Ill health retirement is also payable; proof of this must be sent with application for retirement benefit. TAX AND WILL PREPARATION The union can provide a personal taxation service and will preparation service. Payable to any member who is experiencing loss of wages through being permanently demoted or downgraded as a result of illness or injury. Payment of £300 provided that member reports this to branch secretary within 12 weeks. in full-time education up until the age of 22. Payment is made quarterly and the rate is £12.00 per week for children up to the age of 16, then £12.75 per week from 16 to 22.
the fee. Even if the union is advised that the claim is unlikely to succeed, members who make a claim are eligible to receive free legal advice. BEREAVEMENT BENEFIT A Death Grant of £600 is payable to the nearest relative or legal representative if a member dies through any cause prior to retirement. INSURANCE UIA Mutual offers great value, low cost Home, Travel and Pet Insurance to RMT members and their families. • Interest free direct debits (spread over 10 months) • No fees to amend your policy • Accidental damage to TVs, laptops and game consoles covered • Cover for damage caused by subsidence • Alternative accommodation for family and pets if needed Call on 0800 030 4606 to talk to UK-based call centre agents from 8.30am to 8pm Monday to Friday. on London Overground and the Grand Central and GNWR open access operations. It also has a major train care division. It could not be right that thousands of jobs associated with train operations across the whole of the country were left hanging in the balance awaiting a boardroom decision in Berlin. That is a ludicrous way to run our railways and the only solution to this nonsense is to bring the UK's rail assets back into public ownership. RMT members at Orkney Ferries are also faced with pay and conditions falling behind other ferry operators and service cuts following uncertainty over funding arrangements to keep the crucial inter islands service running. RMT is also launching a fair pay campaign and a ballot for industrial action for Royal Fleet Auxiliary members following the imposition of a measly 1.5 per cent pay increase. The crisis in the bus industry also continues as new figures reveal falling passenger satisfaction when asked about the costs of travelling by bus It is clearly time for a new approach to Britain’s bus service which puts the needs of its people and its workers ahead of profits. Finally it is organising conference season for the various sectors within our all grades, democratic union. I hope to get to as many as possible to share experiences and ideas about how we can defend transport and energy workers whatever their job entails. When you have finished with this magazine give it to a workmate who is not in your union. halt this workplace injustice. “These hardworking staff should be adequately rewarded for all their labour instead of paying workers a pittance,” he said. demonstration outside of Arriva Rail London’s Head Office. RMT general secretary Mick Cash said that Travel Safe Officers offer security for passengers and staff against a background of increasing antisocial and violent behaviour on the railways. they can pay their workers a pittance and get away with it but, by taking strike action and holding this demonstration, RMT has proved them wrong. “RMT remains available for talks and is ready to enter into negotiations in order resolve the dispute,” he said. HAND OVER: Outgoing Docklands Light Railway branch secretary Ray Shackleton is to hand the job over to Aaran Gordon next month. DEAL: Level two technical operators Marian Cinca and Raimonda Gaulilcilene, local rep Phillip Hong, Mick Cash, level two technical operator Kamila Paulowska and incoming DLR branch secretary Aaran Gordon. SUPER PUMA DISASTER 10 YEARS ON Scottish government refuses to back helicopter safety inquiry RMT repeated its call for a full public inquiry into helicopter safety in the North Sea earlier this month as workers from across the industry marked the anniversary of the Super Puma tragedy that alerted the nation to the dangerous working environment for offshore workers. April 1 2019 was the tenth anniversary of the fatal helicopter accident off Peterhead in which all fourteen offshore workers and two crew on board were killed. They were travelling from the Miller Oil Platform to Aberdeen in an AS332 L2 Super Puma model which experienced catastrophic failure of the main rotor gear box – very similar to the causes of two ditchings and the fatal accident off Norway on April 29 2016. RMT sent condolences to the families, friends and colleagues affected, especially as they were forced to endure a Fatal Accident Inquiry process which took nearly five years and achieved next to nothing in the way of justice or meaningful lessons. Today there is growing anger over the refusal of the Scottish government to reconsider its opposition to a public inquiry into helicopter safety. North East Labour MSP Lewis Macdonald has called on ministers to reconsider their decision not to back a public inquiry into helicopter safety in the North Sea, after he received what he has described as a “deeply disappointing” reply from Energy Minister Paul Wheelhouse. body for the offshore industry. “We are not confident that the CAP1145 review will look seriously at commercial pressures on safety standards and it won’t tackle the justice deficit that families of victims of the fatal helicopter incidents in the last decade have endured from the Fatal Accident Inquiry process. “Ultimately, the Scottish government has sided with the interests of the oil and gas industry and against offshore workers in opposing the call for a public inquiry into offshore helicopter safety,” he said. DISASTER: Wreckage from a helicopter being brought ashore after fourteen oil workers and two crew died when a Bond Super Puma crashed off the Aberdeenshire coast on April 1 2009. Ferries last month and took the opportunity to inform senior management face to face that RMT would do everything necessary to defend members’ interests in these uncertain and volatile political and economic times. “I informed members that I will keep them informed of developments through onboard reps and I will make the journey back to Orkney if and when required to secure a positive outcome for our membership,” said Gordon Martin. SOUTHERN PROTEST RMT DEMONSTRATION AGAINST DRIVER-ONLY OPERATION ON SOUTHERN RAILWAYS TIME: FRIDAY APRIL 26 2019, NOON. VENUE: OUTSIDE KEOLIS UK, EVERGREEN BUILDING NORTH, 160 EUSTON ROAD, LONDON NW1 Friday April 26 marks the third anniversary of RMT’s campaign against the extension of DOO on Southern and RMT members from across the country will be gather in London in a show of solidarity with members at Southern. Keolis owns 35 per cent of Govia, and is itself 70 per cent owned by the French state railway.RMT will continue to fight to retain a second safety critical person on the train as well as achieving a safer accessible railway for all. feet?”. DfT quarterly stats published separately show that fares outside London have risen faster than wages over the last year. In metropolitan areas they rose by 3.3 per cent between December 2017 and December 2018 and in nonmetropolitan areas they rose by a whopping 9.7 per cent. This might also help to explain why there were five million fewer bus journeys in non-metropolitan areas in the last quarter of 2018 than over the same time the previous year. RMT general secretary Mick cash said that the survey results confirmed that passengers were being hit hard by the cost of Britain’s buses, with commuters and young people feeling it most. "The Department of Transport’s own figures show fares rising faster than wages everywhere and by a whopping 9.7 per cent in nonmetropolitan areas, while passenger journeys are falling. "We also need to remember that bus services are being wiped out in some areas due to cuts and cherry-picking by the private operators and that of course is missing from this survey. You can't ask people for their opinions on bus services where they simply don't exist. "It’s time for a new approach to Britain’s bus service which puts the needs of its people and its workers ahead of profits,” he said. RMT claimed victory in the Freightliner Ltd and Freightliner Heavy Haul pension dispute last month following an Avoidance of Disputes process which led to the company withdrawing proposals to close the pension scheme to new staff. 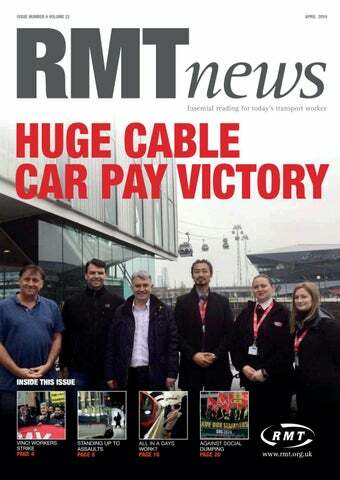 RMT cancelled planned strike action for last month and members worked as usual. The union had been in dispute with the company over its failure to commit to maintaining the current scheme. The company had proposed to deny entry to the defined benefit Railways Pension Scheme for new starters and place them in to an inferior defined contribution scheme. Defined benefit (DB) schemes are based on earnings and funded as a promise to the employee, defining the benefits they will receive in retirement. FIGHTING TO WIN It’s been a busy but successful few months for RMT’s Parliamentary group continuing to support the Guards on Trains campaign and delighted that we have had the breakthrough on Northern and South Western. The members there, as with all the DOO disputes, have been absolutely fantastic and a credit to the trade union movement. A further positive development in respect of the campaign for Guards on Trains was correspondence between the Parliamentary Transport Select Committee and Equality & Human Rights Commission (EHRC). The EHRC stated that driver only trains could potentially be a breach of the Equality Act for disabled people which could be an important issue for the union’s legal and campaigning work in this area. and congratulated them on behalf of RMT on the magnificent result. “Freightliner members had delivered an overwhelming mandate in a magnificent show of solidarity in a ballot to defend their valuable pension scheme as it currently operates. “With strike action looming the company had to take notice and has now come to its senses and committed to maintaining the scheme. “RMT mounted a great campaign, with members meetings across the country addressed by union officers on the proposals and calling for the members to fight. “This is an important lesson for our members and the employers – RMT is ready to take action to defend our pension schemes,” he said. We also need to staff our stations and I was glad to table a Parliamentary motion in support of RMT’s Staff Our Stations (SOS) campaign and the vital role station staff play for a safe, secure and accessible railway. My colleague and Shadow Rail Minister Rachael Maskell also tabled a number of questions to ministers on this issue. Labour’s frontbench, including Jeremy, used Prime Minister’s Questions to wear RMT badges for the Save Springburn Campaign and it is an absolute scandal that the fragmentation and shorttermism of the privatised railway means that rail workers’ skills and the service they provide are not protected – another reason why we need a nationally integrated railway under public ownership. We welcome the victory on DHL where, coupled the threat of strike action, the threat of Parliamentary action also seemed to have the desired effect in getting members a decent pay rise. We continue to oppose outsourcing on the railway – a concern reinforced by the precarious state of Interserve – and we have tabled a Parliamentary motion on poor pay and poor industrial relations at Rail Gourmet. smash it but trying to put that back together is very difficult. “What the companies want to do is harmonise downwards, they’ll go to the lowest common denominator,” he warned. The union is compiling a report on grade disparities “with a view to using that information in future talks”, he continued, saying this was an opportunity for “not just defending what we’ve got but pushing forward so we can get better conditions”. Andy Budds, Leeds City recalled that, upon the 2004 merger of Arriva Trains Northern and First North Western into Northern Rail, grade harmonisation had led to negative consequences for some members. “We’ve been very cautious since then of achieving harmonisation... because of what you’ve got to lose,” he told delegates. go through the roof as well.” He also called on transport workers to be vigilant over the use of CCTV in criminal prosecutions against members dealing with violent passengers. In March Scotland’s High Court of Justiciary confirmed that CCTV on its own can provide “sufficient evidence” for the guilty act. On a weekend which also saw major anti-racist demos across the country, Steve Hedley said that it was important to remember the anti-union record of the far-right. But he said that the bread and butter politics of industrial disputes, through which workers will find themselves standing on picket lines alongside colleagues of all races, could help guide workers away from prejudice. Mr Hedley criticised the arguments currently being mounted over Brexit, saying: “When people say we’re going to crash out of the EU and not have workers’ rights, surely that’s the job of trade unions? If other unions took up that struggle that we have, we wouldn’t be having that debate”. his retirement later this year. Paul then took the floor to talk emotionally about what great “pleasure and satisfaction I have received working for this union. “I started work at 18 and this is best job I’ve ever had because within the health and safety department we were always given huge leeway to develop policy and I want to thank the officers for the way they’ve treated the department. Mick Cash, Steve Hedley and Mick Lynch have always been hugely supportive. “You make a difference on a daily basis to the lives of the travelling public and I think you’re a hugely underused resource and I wish I could be more vocal in making this point so that they would seek your views at the beginning of any process. “We could have saved Network rail £75 million if they had listened to you and they had listened to you, we could be ten years further down the road to a safe railway - so thank you all,” he said. he restated his firm commitment to learning being a core part of union business and that all members, activists and reps bore a responsibility to build the union and make it stronger day by day. He emphasised the three key tenets of organise, educate and agitate. Education officer Andy Gilchrist dealt with the task of leading the new look RMT learning team. He said that the aim is that the lead learning organisers would not just be sitting in an office and sending out emails “They will all be out there in the real world, supporting, ULRs and learners and working to ensure good support from employers and providers for our members,” he said. Delegates were fully engaged in making the learning agenda a part of what the union does, coming up with ideas and, supporting the aims of the Union Learning Fund bid and feeding good quality proposals into the strategy which will be developed to start delivery next month. As a member of RMT, you have the opportunity to join the BHSF health cash plan. By joining, you and your family can claim cash towards your everyday healthcare costs, including dental, optical and therapy treatments, plus much more. The health cash plan available to you has changed; your brand new Health4All health cash plan has enhanced benefits to help you better manage your healthcare costs. One of the key changes is that you can now claim every year for optical, hearing aids and health screening. date of your policy with the exception of maternity benefit which is subject to a 10 month qualifying period; and if you have an existing medical condition, you will have to wait two years before you are covered for hospital claims for the same or a related condition. Telephone helplines can be accessed from the start date of your policy. For more information about the BHSF Health4All health cash plan, or to apply, call 0121 629 1089. *based on the personal Gold cover at £18.50 per month. RMT rep Ross Marshall and RMT assistant general secretary Steve Hedley attend the TfL conference to tell delegates that there is a direct correlation between staff cuts and the growing number of assaults. those responsible for verbal and physical assaults and that those cases are well publicised to deter others. “RMT is in no doubt that the current environment has emboldened those with hatred and violence on their minds and the union is taking our case for genuine and meaningful action to turn the tide to the TFL summit,” he said. ACT ON RACIAL OFFENCES British Transport Police fail to prosecute nearly 40 per cent of racially aggravated offences RMT called for urgent government action and increased resources last month after new figures released showed that the British Transport Police failed to identify a suspect and make a prosecution in 37 per cent of racially aggravated offences. The BTP, who have seen their resources severely stretched in recent years while station and train staffing numbers have also been hacked back, have the third worst record of any force in the country. The figures are drawn from policerecorded crime data for England and Wales published by the Home Office and cover five types of offences, all of which have a specific racially or religiously motivated element defined under law. According to the Home Office, "these racially or religiously aggravated offences are by definition hate crimes". RMT general secretary Mick Cash said that the latest figures come the day after RMT released shocking statistics and evidence of racially-motivated assaults against staff on London Underground and contribute to the overall picture of violence spiralling out of control on the transport network while staffing levels are hacked back to the bone. “The government should be hanging their heads in shame, on their watch more than a third of those thugs engaging in raciallymotivated hate crimes on the services covered by the BTP are getting away with it. “This culture of violence, abuse and assault on the transport system has to stop and that means making the resources available to turn the tide. These shocking figures are the result of years of austerity and cuts driven by pig-headed political ideology,” he said. COMMITTEE: from left, outgoing RMT women's advisory committee chair Christine Willett, incoming chair Marie Harrington, committee member Jennifer Aggrey-Finn, ITF maritime coordinator Jacqueline Smith, RMT president Michelle Rodgers. unionist Clementina Black with a blue plaque in Brighton. NEC member Steve Nott agreed to propose that the appeal for funds is also sent out to branches. Kim O’Shaughnessy, Lewisham, Southwark and District said: “There’s an absolute absence of women in our history.” RMT general secretary Mick Cash told delegates: “You’re not just women, you’re RMT women” and he believed his predecessor Bob Crow would have been “particularly proud of the progress we’ve made as a union”. “We’ve balloted that much that the Tory government introduced a law to stop us balloting,” he said. He said that support for public ownership of both railways and buses was now the norm because RMT keeps campaigning and make it a political issue. But he stressed: “We need to be looking in the future as to how we get more reflection of the diverse nature of our union in key positions”. Mood of conference was best summed up by Mandy Evans, Swansea 1, who said: “Out there we fight - and we do fight, because we’ve got a different attitude and a different approach”. mandatory for public service rail contracts in the EU (See EU rail privatisation timeline). EU BUS ‘LIBERALISATION’ In February 2019 the European Parliament also voted in favour of further liberalising bus and coach services across the EU, revealing that opening markets have priority over the defence of quality services and decent work. As we have seen following bus privatisation over 30 years ago, it will put vulnerable communities at risk of losing their transport links, because unleashing competition in the sector will focus provision on the most profitable routes. Meanwhile, budget companies like Flixbus will have free rein to expand their lowwage employment model to drivers across Europe. Frank Moreels said that the vote only served to hit passenger transport workers with the same social dumping that their colleagues in the freight sector already face. “We will inform our drivers about this vote and the risks it creates for passengers and workers who depend on the bus and coach industry. “Let’s see how they react at the ballot box in May, when they see who is responsible for this bad vote and who supported our union vision,” he said. RAIL PRIVATISATION TIMELINE 1991 European Commission introduces rail directive 91/440/EEC on July 29 demanding the separation of infrastructure and operations, open access for international undertakings and the introduction of track access charges. 1992 The Railways Regulations 1992 introduced under Section 2(2) of the European Communities Act 1972 in order to comply with the directive. 1993 Tory government privatises British Rail under The Railways Act 1993. 2001 EU’s First Railway Package demands ‘liberalisation’ of rail freight, implemented in Britain in November 2005. 2004 Second Railway Package demands open access for all types of rail freight services by 2006 and establishes a European Railway Agency to oversee implementation of EU directives. 2007 Third Railway Package demands ‘liberalisation’ of passenger rail services requiring open access in all EU member states by 2010. 2009 Lisbon Treaty removes the national veto on transport, transferring decisions to Qualified Majority Voting (QMV) allowing member states to be outvoted. 2012 First Railway Package ‘recast’ to establish a single European railway area and outlaws member states from using the "holding model" to manage infrastructure and operations within the same parent company 2013 European Commission publishes a Fourth Railway Package which requires the compulsory competitive tendering of all rail services by December 2019. ON BOARD SIR DAVID ATTENBOROUGH RMT visits new generation British Antarctic Survey ship due to come into operation next year Royal Research Ship (RRS) Sir David Attenborough (SDA) is state of the art for the latest in high tech maritime science and due into service by 2020 for The British Antarctic Survey (BAS) the country's national Antarctic operation. The vessel is named after famed broadcaster and naturalist David Attenborough, and is currently being fitted out. The new ship will be fully equipped with the latest instrumentation for the purposes of carrying out research, with improved icebreaking capability and greater endurance over existing polar research vessels, and serve as a logistic support vessel for BAS teams in inshore locations. It is part of the Natural Environment Research Council. represent ratings on-board SDA and are currently involved in the British Antarctic Survey transition from two ships to one ship where SDA will replace RRS Ernest Shackleton and RRS James Clark Ross. NO TO RACISM I have to start this month’s column by making clear I am 100 per cent against all kinds of fascism and racism. My column last month raised concerns from members and how it read, apologies to anyone if you were offended. I will continue with the demo that took place in London last month with stand up to racism which had a turnout that was fantastic to see from many groups across the country and was a pleasure to be part of with one clear message that we want our streets to be fascist free and we will march every week to deliver this message if we have too. I must also say how disappointed I am with the attack on RMT member Eddie Dempsey, whatever our differences in this union maybe there's one thing we do agree on and that is Eddie is no racist! I am overwhelmed at the support I receive when out and about in the RMT community and the message is clear that our union has moved forward in a direction that can now always be accessed by all. DIVERS MEET Divers turned out in numbers for a meeting in Newcastle with RMT national secretary Darren Procter and regional organiser Jake Molloy to discuss the current situation with the diving agreement. It is planned to stage similar meetings in different parts of the country during the coming months. 13. These are open to all RMT members and are fully funded by the union. If you would like to attend, please apply online on the union’s website or speak to your branch secretary. MEMORIAL: RMT general secretary Mick Cash unveils the memorial organised by RMT Glasgow shipping branch to those who fought and died breaking the fascist blockade during the Spanish Civil War. The memorial recognises the bravery and sacrifice of the Scottish seafarers who helped to defy the British government’s policy of non-intervention during the battle for democracy in Spain and brought crucial support to tens of thousands of refugees in Spanish cities isolated by Franco’s fascist forces. NO PASARAN: Members of the British Battalion, Major Attlee Company, 15th International Brigade, displaying their banner during a lull in the fighting during the Spanish Civil War of 1936-1939.
vessels passing through forbidden waters - could only be enforced by belligerents. If belligerent rights were granted to the Nationalists, then British merchant ships could potentially be intercepted; if the rebel navy’s belligerence was not recognised, however, the Royal Navy would be obliged to defend British shipping from interference, and Britain’s policy of non-intervention would evaporate. As the historian Hugh Thomas put it, with evident disdain: “How much less trouble, therefore, it would be if there were not British merchant ships going to Basque ports at all!” As Franco’s forces were laying mines in Bilbao harbour, then-Foreign Secretary Anthony Eden was explaining to an angry House of Commons that any British ship approaching the blockade could only be assured of naval protection until the three-mile limit: “Our hope,” he offered weakly, “is that they will not go.” Eden’s feeble hopes were, as it turned out, less than convincing to those who cared more for those whose fates were entwined with that of the Spanish Republic. The blockade was circumvented by British ships, the seafarers of which often paid a mortal price for showing greater bravery than the government they defied. According to the Spanish Republic’s embassy in London, up until June 1938, 13 British merchant ships were sunk, 51 were bombed from the air, gives were attacked by submarines and two were damaged by mines. 35 British seafarers were killed. By the end of the war, that tally was almost certainly higher, though the true number of deaths remains unknown. Many of those who died were members of the National Union of Seamen, the antecedent of the modern RMT, and one of the many trade unions whose rankand-file felt sympathy with the left-wing Spanish Republic. Their sacrifice has now been recognised. With the support of RMT Glasgow Shipping branch, a memorial designed by the sculptor Frank Casey now stands on Glasgow’s Clyde walkway. Appropriate enough, it sits not far from Arthur Dooley’s famous state of the Spanish communist leader Dolores Ibarruri – ‘La Pasionaria’ – which was erected in tribute to the 65 Glaswegians who, along with hundreds of other Scottish volunteers, joined the International Brigades in defence of the Spanish Republic. Much like that defence, mounted by those from around the world who saw in Spain’s bold experiment the hope for a potential future, the history of trade unionism is of one of solidarity in action. It is also a history of battles fought and lost, but crucially remembered; that which is forgotten can never inspire. That inspiration persists, and so do the battles. Last month, RMT members joined comrades and campaigners in 60 cities and 22 countries around the world, in defiance of a fascism that has mutated with time, adapting to 21st century circumstances where the derangement of capitalism has provided it with fertile territory once again, but has never and will never fundamentally change. In all honesty, the blockade runners now honoured in Glasgow deserve more than a memorial. They deserved the support of those who could have provided it, but did not. They deserved to see the fruits of their efforts, and the better future they hoped might transpire in consequence. The Spanish Civil War is a reminder – as if one were needed – of the breath-taking injustice of which history is capable; proof that you can have the most noble cause in the world, with some of the finest comrades ever to commit to struggle, and still lose. In the face of that, the victories of those seafarers who beat back fascism are all the more important. branch recently. John was a Network Rail area council rep and former chair of Carlisle City branch. RMT members were also present left to right: Tina Watling, Moi, Lisa Bird, RMT docker rep: Dean Galloway and Stephanie Leeks. Cash. Shashikant works for Network Rail at Birmingham New St Station. Officers in their negotiations with companies. To succeed in this role you will need: • An ability to provide professional advice on a range of employment issues including industrial action ballots, disciplinaries, capability, grievance, changes to terms and conditions and discrimination issues. • To work flexibly with a minimum of supervision • To demonstrate an understanding and support for the core principles of the RMT and the trade union movement. In return RMT can offer you a friendly working environment, a final salary pension scheme, generous annual leave, assistance with travel to and from work. If you are interested in this role, please visit the RMT website https://www.rmt.org.uk/about/job-vacancies for an application pack and form. The closing date for completed applications is Friday, May 10 2019 at 16.00 hours. RMT is an Equal Opportunities Employer and appointments are made on merit, ability and relevant experience. than he anticipated, Adrian felt that the time had come to to take his retirement. Banjo Adesanya said that Three Bridges branch invited NEC member Paul Burton and South-East regional organiser Paul Cox to do the honours at a retirement get together for Adrian. “We wanted to show our appreciation for his level of commitment to us as a union over the last 37 years,” he said. During the get together Paul Cox presented Adrian with a hip flask and the branch secretary Dave Crawford presented Adrian with a bottle of Malt Whisky, which was donated by branch members. Adrian is looking forward to starting a new chapter of his life and as a now retired. Last month’s solution... The winner of last month’s prize crossword is John Davis, Poolene. Send entries to Prize Crossword, RMT, Unity House, 39 Chalton Street, London NWI IJD by May 1 with your name and address. Winner and solution in next issue.